Learning how to make bonsai bend and curve into a desired style is only a matter of practice. Wiring is one of the most important steps in shaping and forming your tree. It helps you redirect branches, control growth, and manipulate individual limbs that will unlock your creativity and enhance the overall work of art. Almost every bonsai tree has been wired to some extent, and it really is quite easy, once you become familiar with the process. Bonsai wire is either aluminum or copper, and either option will work fine. The silver color of the aluminum is easier to see when training trees, especially if there is a lot of foliage; however, the copper wire is much less obvious so it will not take as much away from the aesthetic appeal. When learning how to make bonsai take the shape you want it to, the wire you choose must be thick enough to bend the branch and hold it in place, but not too thick that it will damage the limb. Thicker branches will require thicker wire. If your wire is not strong enough for the job, you can always double wrap the wire by running two pieces parallel to each other. Basically, you should be able to apply the same effort when bending the wire as what is needed to bend the trunk or branch. 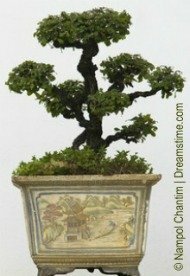 To achieve the best results when bending and shaping your bonsai, it is important that you wire the tree when it is most receptive to change. Trees have different growing cycles, so the optimal wiring season may vary. You should check out the specific needs of your plant before beginning any extensive shaping. For most deciduous trees, it is best to begin wiring during Spring or Summer when tree growth is vigorous. Active growth will help the bonsai acquire its new position much more quickly, sometimes within 2-3 weeks. Trees that are wired later in the growth cycle may need a couple of months to achieve the same results. It is not recommended that you begin wiring in the autumn, as the bonsai will not be able to heal and recover properly during its dormant period. Conifers can usually be wired at any time of year and may be left in wire over the winter, although it is still important that you investigate the recommendations for your particular species. 1. Always begin with the thickest branches and heaviest wire, and gradually move to the smaller branches and thinner wire. 2. Measure the branch you are wanting to shape, and cut a piece of appropriately sized wire about 1/3 longer than the branch length. Some people prefer to hold the spool in the palm of their hand and snip the wire when they are finished wrapping; however, you may find this quite awkward when working with larger spools or thicker wire. 3. Anchor one end of the wire to a secure spot. The spot you choose will depend on the size of the bonsai and what part of the tree is being wired. You can anchor your wire to the pot, another branch, large root,or trunk. For smaller trees, inserting on end of the wire into the soil close to the trunk may be sufficient. Simply wrap the wire around the trunk until you reach the desired branch. 4. Always begin wiring at the base of the branch and work toward the tip. Support the branch that is being wired with one hand while using the thumb and forefinger of your other to coil the wire around at a 45 degree angle. Inch your supporting hand forward along the branch as you work your way toward the tip. Be careful not to wire over any foliage by weaving between leaves or shoots. Do not cross wire as overlapping can cause serious damage to the tree. Try to keep the coils as evenly spaced as possible and fairly close together. If they are too far apart, the wiring may not be strong enough to give you the desired result. When you reach the end of the branch, make sure the last turn of the wire is at a 90 degree angle to the branch to secure the wire to the tip. Keep in mind, if you want to lower a branch or push it down, the first twist of the wire should come over the top of the branch. If you wish to push the branch up, then the reverse applies, with the first twist coming from below or underneath. You also have the option of wrapping in a clockwise or counterclockwise direction. Looking at your bonsai, when working on the right side, wrapping counterclockwise will move the branch forward while wrapping clockwise will push it away. When working on the left side of your bonsai, the opposite is true. 5. Bending your bonsai. There are two different approaches to bending your bonsai. Some artists prefer to wait until the wiring is done to bend the branches or trunk into the desired shape. If the branch does not stay where you place it, then a heavier wire is necessary. Other bonsai enthusiasts like to bend while wiring, applying the wiring with one hand and using the other to bend the branch as they move along. With this method, there is a much higher risk of breaking or splitting branches, so it is not recommended until you are quite experienced at the wiring process. Of course, you can always combine the two methods by wrapping a section, then stopping and bending it before moving onto the next section. Study your tree carefully and plan all bending and shaping ahead of time. You only want to bend a branch once, as repeated movement can cause serious damage. No matter when you bend your bonsai trunk or branches, it is important to do so carefully. Bend them slowly and watch (and listen) for any signs of cracking or splitting. If this happens – STOP immediately! It is better to use multiple periods of wiring rather than making drastic changes too quickly. And, keep in mind that some species are more prone to easy splitting and breaking, so bending can only be done when the tree is very young and pliable. Wiring is only left on the bonsai for as long as it takes to set the new position or shape. This can be as little as two weeks if the plant is in its growing season or if the foliage is very small or young. However, larger branches and trunks may require longer wiring times. Length of time will also depend on the species of tree, how fast it grows, where you live, and time of year. Keep a careful eye on your wired branches to make sure that the wire isn't becoming too tight and cutting into the surface. Leaving the wire on too long can cause severe damage and scarring to your tree. It is recommended that you cut the wire from the tree rather than trying to unwind it, as this can cause damage. When the wire is removed, if the branch or trunk does not hold the desired shape, then you will need to rewire. 1. Do not wire an unhealthy or sick tree. Bending your bonsai causes stress and damage to cells. As your plant repairs itself, it takes on the shape that you are training it to acquire. A sick or unhealthy tree is unable to make these repairs, which may result in loss of the branch or even death of the plant. 2. Altering of a branch should not begin where the branch meets the trunk. Trees are more prone to ripping or breaking at this point, so it is recommended that you start the bend a little farther out. 3. Do not water your plant for at least 24 hours before wiring. A tree with less water will be more pliable and have less sap flow. 4. Plan ahead. Repeatedly bending a branch can weaken it and cause damage or splitting. Decide what you want to do ahead of time so that you are not causing unnecessary stress to your bonsai. 5. Protect foliage. When wrapping wire, be careful that you don't trap foliage. This will not only cause damage to the leaves but can also make the plant more susceptible to infection. 6. As you move down a branch, you may need to change wire sizes if the limb becomes significantly thinner. You want to be careful that you don't use too thick a wire on delicate or small branches. Learning how to make bonsai bend and submit to your gentle touch requires time and experience. But, as you become familiar with the art and the processes involved, using wiring to style your tree will become second nature. Wishing you much success as you develop your skills and learn how to make bonsai take the shape you envision.